Slow acclimation—little by little—is the best remedy if your dog is too excited to greet the newborn in your arms. Allow your dog to participate in ritual activities like diaper changing, feedings, and story time. Participating means she would sit or lie down while you and the baby take care of these activities. All she has to do is be in the room and not be overly excited. Remember, your dog has a lifetime to adjust to this little person. Take your time. During the calm greeting, your hands should always be within inches of the dog’s nose so you can easily insert your hand between your dog and your baby. That way, if your dog gets a little too excited, you can prevent licking or nibbling. An innocent theft of a newborn’s hat or nibbling on a tasty piece of baby clothing often has parents wondering if the dog was trying to bite the child or if the child was actually grazed by teeth, and may end with the dog being punished for just being curious. Additionally, a dog’s tongue is filled with bacteria a newborn cannot protect against, so licking a newborn’s face and hands is not an option. Licking of the feet at the early stages is okay, when they cannot put their feet in their mouths yet. 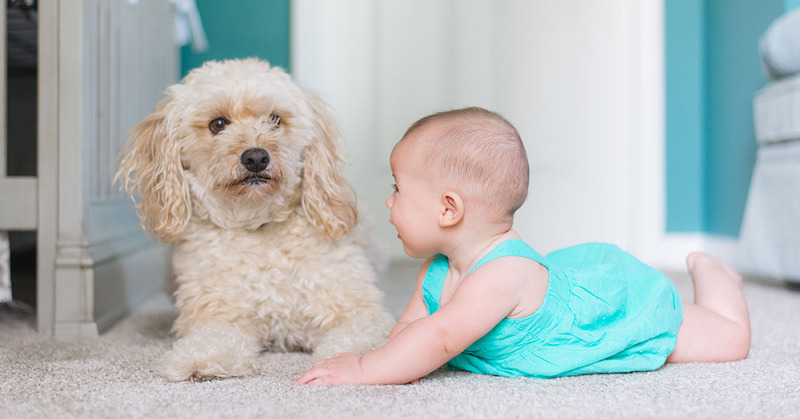 You also want your hands right there between the dog and baby for introductions so the baby does not put his hands and fingers into the dog’s mouth, pull fur, poke the dog’s eyes, or smack her upside the head. These actions on the part of the child are not intended to offer insult or do harm but could cause your dog to become fearful of your baby or react in an inappropriate way. This is certified professional dog trainer Lisa Edwards’ endearing and entertaining journey to ensure that her household survives and thrives when she introduces her son to her motley pack of animals.